The perfect combination! Farm Fresh Blackberries and Bananas meet to make these delicious cookies. Snack or Dessert, your pooch will bark for more! Blackberries are an excellent source of Antioxidants. Bananas are loaded with Potassium, are a good source of vitamin C, vitamin B6, manganese and folate which are all necessary in promoting the health of your Four-Legged Friends. 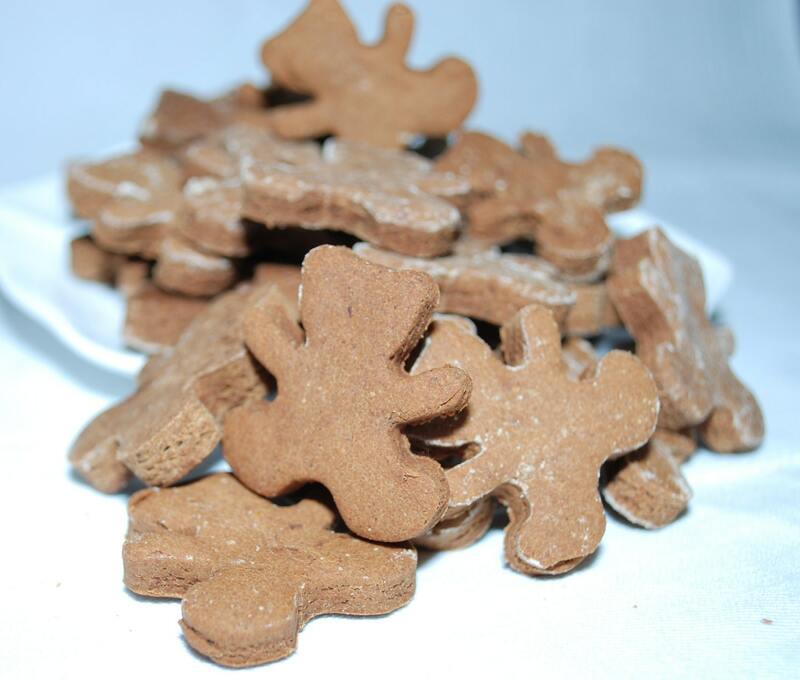 * Each cookie measures approximately 1 1/2 " long, perfect treats for a medium to large pup. We are happy to bake them in small or large too. Please message us if you would like a different size. Organic Oat Flour, Organic Bananas, Blackberries, Cage Free Eggs, Non-GMO Canola Oil, Organic Honey. * Our dog treats are best if enjoyed within 45 days of purchase. They can be stored in the original package at room temperature or refrigerated . They can also be frozen for up to 6 months - please thaw them before letting your precious pooch enjoy. * Our packaging is made out of Polylactic Acid (PLA) – plastic made from corn! Because PLA is light and made from renewable resources, it helps reduce our carbon footprint! At Barkin' Bones Bakery, all cookies and treats are baked in small batches, fresh to order, using only Organic Oat Flour and all natural, human grade ingredients. We realize that pets, just like humans, may have food sensitivities. Upon request, we will make every effort to make substitutions to meet your pet's needs. My mom's dog is in love with these treats! I definitely recommend them! When he sees them grab the container he wags his tail so much his entire body goes side to side! We are happy to accept payment via Paypal, which allows you to pay using your existing Paypal account, bank account, or credit card. You don't need a Paypal account to use the Paypal service. We also accept credit cards and Etsy Gift Cards!! You and your dog(s) satisfaction with our products are top priority to us. If for any reason you are not happy with your purchase, please send us a message via Etsy or via Email. We can offer an exchange or refund on any item returned to us (minus shipping and handling). ** If your package is returned to us undeliverable, we will make every attempt to contact you. If we are unable to contact you, we will refund the cost of the goods minus shipping costs. Once your order is placed, your treats will be shipped to you via Priority Mail within 3 business days - most times we are able to ship them sooner! If your order is placed between Thursday and Sunday, the treats will go out the following week to ensure freshness since we do not know how the post office stores packages over weekends or holidays. Recently, we were forced to increase our shipping prices due to USPS increasing the cost. After the shipping price is calculated, if you have overpaid $1.00 or more, we will reimburse you the difference. We realize that pets, just like humans, may have food sensitivities. Upon request, we will make every effort to make substitutions to meet your pet's needs! Special requests? Send us a message! Unless stated otherwise on the package, our treats will stay fresh for up to 45 days when stored in an air tight container. If you feel that your pup will not consume the treats within that time, please refrigerate or freeze all or a portion of the treats. Remember, we don't use any preservatives! For long term storage, all of our cookies and treats freeze extremely well for up to 6 months. Our cookies and treats make a perfect gift! We can ship them directly to the recipient and attach a special message from you at no extra charge! Interested in buying wholesale? Send us a message for details! If there are any additional questions you may have, please feel free to contact us!